The following is a reference / historical listing of the 70-millimeter presentations of “Close Encounters of the Third Kind” in North America. 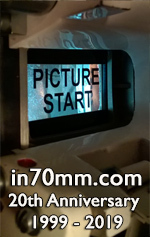 The film’s 70mm prints consisted of full-frame imagery blown up from anamorphic 35mm. The audio on the majority of the prints was Six-Track Dolby Stereo (“A” encoded “baby boom” format). Some prints lacked Dolby noise reduction or were played back on non-Dolby brand equipment. “Close Encounters” was among two confirmed first-run films released in 1977 with 70mm prints for selected engagements. The Columbia/EMI presentation was directed by Steven Spielberg and starred Richard Dreyfuss, Teri Garr, Melinda Dillon and Francois Truffaut. The film’s premiere was held November 15th at the Ziegfeld in New York. All presentations included in this listing from 1980 were the revised Special Edition. The information in this article was principally referenced from film industry trade publications and regional newspaper promotion, with thanks to Don Beelik, Bill Kretzel, Mark Lensenmayer and Stan Malone.